As we head into another holiday weekend, here are some fun facts about this season’s movie musicals and the vibrant soundtracks bringing them to life. 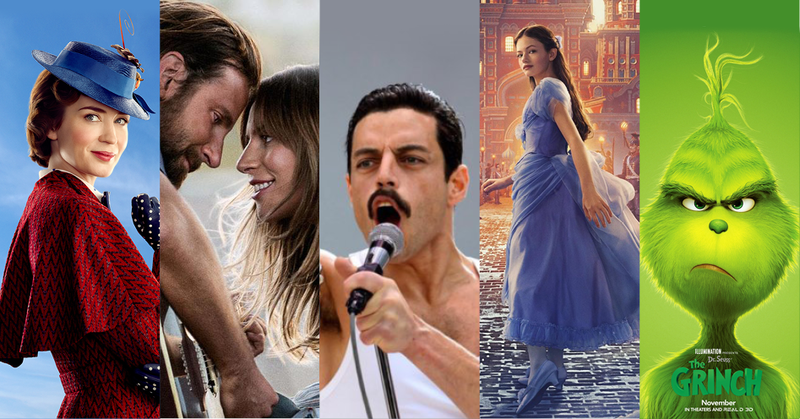 Interestingly enough, each film takes viewers on a new sonic journey while paying homage to beloved pop culture icons of the past—both real and imagined—ranging from Queen’s dynamic front man to a magical nanny with tunes to cure any and all ailments. In this sequel to the 1964 Disney classic that added “su·per·ca·li·fra·gil·is·tic·ex·pi·a·li·do·cious” to mainstream vocabulary, the magical Mary Poppies returns to London two decades after the original story’s end to care for the next generation of Banks children. With such a memorable original score by the Sherman Brothers, lyricist Scott Wittman and composer Marc Shaiman—who are best known for Hairspray—set out to create a score that paid homage to the past while bringing life to the distinct new story being told. “This score is such a love letter to that Sherman Brothers score and to the original,” explains Lin-Manuel Miranda (who plays Burt in the new movie) “It’s a joy to be a part of it.” With a soundtrack filled with songs like the uplifting “Nowhere To Go But Up” and the imaginative “A Cover is Not a Book,” you’re bound to leave the theater humming. This beautiful, heart-wrenching tale follows three earlier adaptations—first in 1937 with Janet Gaynor at the helm, followed by a 1954 musical version starring Judy Garland, and most recently a 1976 musical version featuring Barbra Streisand. The film features the raspy rock vocals of the film’s director and co-lead, Bradley Cooper, alongside the raw, soaring vocals of Lady Gaga who boldly performs without the theatrics that generally accompany her performances. During her screen test, she recalls Cooper asking her to remove her colorful makeup. “Completely open,” he said. “No artifice.” The soundtrack has seen chart-topping success with tracks like the poetic, piano-driven “Always Remember Us This Way” and “Shallow”—which received four GRAMMY nominations earlier this month. If you’re looking for a fun way to relax, refuel and enjoy some festive music during this busy season, look no further than the movie musicals at your local theater!